Let me start with the assumption that I'm one of the few people entirely outside the Deaf community to pick this book up. I read Seeing Voices by Oliver Sacks way back when, and the idea of Deaf culture never left me. Reading around on forums a little brought me to this book - probably the Deaf culture bible right now (if there is such a thing, though a few blogs I've read certainly make it seem like it), and definitely one of the first books you should pick up if you're interested in all things capital D. I find this book of anthropological value, few to no people know of such a thing as Deaf culture, and the common heritage these people feel binds them, nor are they aware of the beauty of sign language. And deaf clubs? Wut? A Deafhood university course? You bet. As a complete outsider, I found this book exciting. I'm always on the lookout for hidden facets of the society we live in, and I have a deep sociological and anthropological interest. For someone like me, finding this book is like striking gold. Well-written, engaging and comprehensive, this book is definitely a gem if you're so inclined. The author comes across as an awesome fellow, and I found his narrative to be both easy going and ingraciating. The author insists that one can pick and choose the chapters of interest, and go from there, though in reality, it's probably best to start from the beginning and work your way in, if you're a newbie to the scene, he does explain a lot of basic things in the first 100 pages, and if you delve deeper in, you'll regret having failed to read his introduction to Deaf thought and the Deaf history, something I'd strongly advise you "plow through" to fully understand the things he touches on later. This is an important book, and a detailed summary of Deaf culture and thought, and most importantly - written with the newbie reader in mind, which is sometimes rare in specialised literature. The only "con" I can think of is that it's not a short book, and does demand more than just a baseline of interest to stick with, especially since it commands attention to the plethora of information it provides. I found my brain steaming at times and found myself putting it down for a week or two before returning to it, as well as re-reading parts I'd read before and forgotten the important bits of. Not for everyone? You bet. Then again I doubt you came to this page from browsing Dan Brown novels. 5.0 out of 5 starsSpringboard for further thought. A textbook for one social model to view the Deaf community. The author describes history, his own journey to acceptance of himself as a Deaf person, and his experience becoming culturally Deaf. The British expression and sociological jargon can be hard to wade through. Hopefully there will be more social models in the future springing from this inspiring book. Used as a reference for a research project while a professor of Master's degree Special Education. Great resource. Also good for teachers and families of students who are deaf or other similar disability conditions. 5.0 out of 5 starsIn deafness, there is light!! Paddy Ladd captures the sensibilities of being deaf. The book deals with the reality of surviving in a microcosmic society with it’s own sociological percepts through its own language, its own cultural values, its own mores and norms, and its own togetherness. It was written in attempt to clarify the essence of being deaf in the deaf community at large. For those who seek to understand who and what deaf people are about then this book is, indeed, a must read! 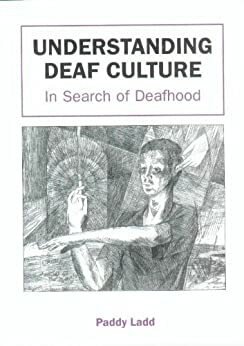 Great introduction into the world of Deaf Culture, as I never realized how different their perspective is from a 'hearing' person's.. An interesting read.